I'm sure you'll recognize the carpet, and I'd like to thank Mica for the photos. We should also cut her some slack, because on both occasions the lighting was really poor, and these are the originals with no attempt to cleanup in PhotoShop. But they're not bad, and I think you'll get the idea. Without further ado, allow me to introduce "my bass". For those of you who might be browsing here because you're considering a Rogue, here are the main differences from the standard model, aside from the obvious things like ebony neck laminates, continuous plates, and the electronics. - The upper horn is about 2 inches shorter, and lower horn an inch longer, than standard. Otherwise, the outline of the body is exactly the same. You'll notice the lower strap attachment is positioned well up the side of the body, to compensate for the shorter horn. It hangs right at 1:30. - It has narrow ("classic") string spacing instead of the usual wide/comfort. This photo has the usual perspective problem - it really looks like a smaller body on a much longer neck. Also, the cone peghead was reduced in width, so that the strings run straight rather than fanning out as usual. Not that you'd be able to tell from a photo, but the neck is about an 1/8 inch thicker (the "Sterling" shape) than standard, because I wanted a little extra mass and stiffness. - As you'll see in other photos below, there is no "tummy contour" on the back, and the so-called "elbow contour" on the upper wing is much less pronounced than usual. The accent effect from exposing more of the core here just wasn't appealing to me, so we scaled it back (and the way I happen to play, it's my wrist that rides on this area - my elbow isn't anywhere close, but I guess I'm just weird). - Instead of the standard MXYs, I started with two FatBoys. Since then, I've replaced the neck pickup with an AXY, in which the coil is positioned off-center, as close to the bridge side as possible. And then of course there are all those extra knobs, but we'll get to that in a bit. Those are the most obvious differences in appearance; we're getting into the smaller details in the next bunch. - It's an oil finish. - The bridge is the "curved rail/concealed hardware" style, plain raw brass (no lacquer). - The accents are minimalist, just a single ebony pinstripe front and back (between coco bolo top/back and mahogany core). We also added the ebony stripe between the neck and body wings (known as "framing"), though it's almost impossible to see in these shots. - The front and back laminates were done with an "offset bookmatch". Take a look at the back, and you'll notice a small dark knot in the lower horn. Find the other half in the upper horn (almost lost at the edge of the glare), and also note how the grain bulges out where the body squeezes in. Apparently no one had done this before, but it seemed obvious that's what the wood wanted to do, with this body shape... 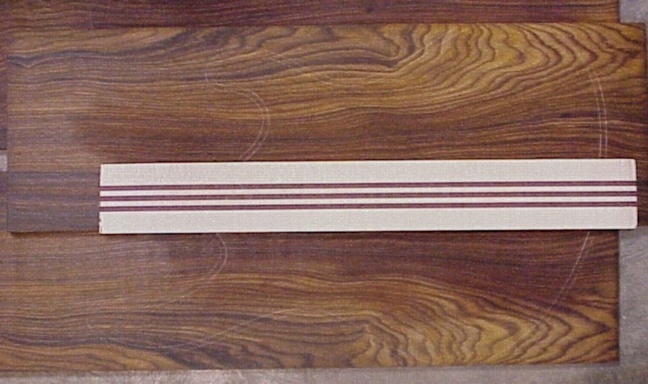 The front pieces were also offset, as you can see in the photo below prior to cutting. They sort of evened-out a little in the sanding process, but you can still see it. - Oh, and then there's the ebony nut (many of you have already seen the one on Valentino's masterpiece). This is a good story. We were a few months into the "taking longer than expected" phase of construction (most recently due to The Flu That Shut Down Alembic, as I recall), when someone on the club started a brief thread asking about using bone as a nut material. I called Mica a day or two later and said, since it's a fretless, could we make an ebony nut? <silence...> so I decided to push my luck, adding "Of course, I'd still want it to be adjustable..." <hold breath>. Thankfully, Mica's response was something like, "Why didn't I think of that?!". I left it to Mike to figure out what it should look like, and he did a really tasteful job. There's even a thin brass plate inlaid on the underside, to give it a little extra strength and bite for the adjusting screws. And check out the grain patterns on the peghead. We couldn't find any interesting leftovers from the body laminates, but they sometimes shave off veneers if there's extra thickness to start with. So Mica suggested that Kris dig into his private stash, and sure enough, we found several pieces that were clearly from the same board. Kris did a beautiful job of placing these, I think. I made one other change last summer, which was to replace the brass bridge block with something heavier. The original order called for 2 or 3 alternate blocks, they ended up supplying me with 5, and after that it just sort of got out of control... I'll start a separate thread one of these days to describe those experiments. Hmm, maybe that's not too helpful... but as you can see, with a few notches and some undercutting, they managed to squeeze everything into the standard body cavity. Those circuit boards are custom, of course, which is another long story. Okay, it's pretty simple <grin>, just a basic master vol/pan/bass/treble section, plus half of a SuperFilter that may be assigned to either or both pickups. It took many discussions and lots of thinking time to get there - we started with more modest concepts, like having a single low pass filter that could be assigned to one or both pickups; shifting the filter frequency range down by an octave or two; and so forth. In hindsight, it seems pretty obvious this was the only way to get the flexibility I was looking for, but the design and construction was a huge undertaking for Ron. The filter section is identical to a single SF-2 channel: frequency down to 45 Hz, low/band/high pass toggle, direct and filter gains, and of course CVQ. The filter is always in-circuit, but can be defeated simply by turning filter gain off and direct gain to max. To appreciate how flexible this is, it helps to follow the signal path. Start at the pickups, each with internal gain trimpot, and then go through balance (pan) - keeping the signals separate - and on to the filter assignment toggle. Let's say the filter is assigned to the bridge pickup. The bridge signal is split, with one path to the direct gain control, and the other through the filter (freq and Q) to the filter gain control. The direct and filtered bridge signals are summed, and then in turn summed with the straight signal from the (unassigned) neck pickup. Note that in this example, the neck signal completely bypasses the filter section, and does not go through the direct gain control. The beauty of this is that you have a 3-way mix capability as long as the filter is assigned to one pickup rather than both. Ron surprised me here - I was thinking there would only be a 2-way mix, filtered and everything else. Finally, bass/treble and master volume are applied to the combined signal, and we exit through the 1/4" mono jack (side mounted, you can see the edge of it left of the filter gain). Somewhere during the design, Ron decided he needed a bit more power, and since the battery compartment had already been routed, he just threw in a little power amplifier to get 18 volts (+/- 9) out of a single battery. Fortunately, I bought myself an SF-2 and had about six months to experiment with it before getting the bass. It still took some time to understand - and there are huge ranges of tone I haven't even begun to explore - but for my purposes, I haven't yet been able to imagine anything I would prefer. It was well worth the wait, and I still can't believe what an incredible job Ron did on this. There are no surprises, like unexpected changes in volume, and of course it's dead quiet. Most of the time, I'm interested in sounding closer to an upright than electric, but that's not one tone - there are a lot of subtle and interesting variations. The thing I appreciate most about this setup is that it's easy to make (and reproduce) fairly sensitive adjustments. With the usual low pass filters, you are mostly limited to subtracting, as you roll off the filter frequency, though of course you can add a narrow boost with some Q. But with this setup, I find it easier to think about adding something: using a band pass to pull out some mids or highs from the neck pickup, for instance, or (my favorite) pulling in more lows from the bridge, and dialing in only as much as I want to add (or perhaps backing off a little on the direct gain, depending). I could go on, but that's probably enough for now. I'll just wrap up by saying that I'm keeping the SF-2 (don't have a preamp), but for several months now I've only been using one channel of it, and that's mostly to adjust the ELF output. With a little extra gain, I could plug straight into a power amp and have all the flexibility I need. Quite remarkable. Bob; I love it!! The superfilter is of course a great feature; and the signal path is a really great idea too. 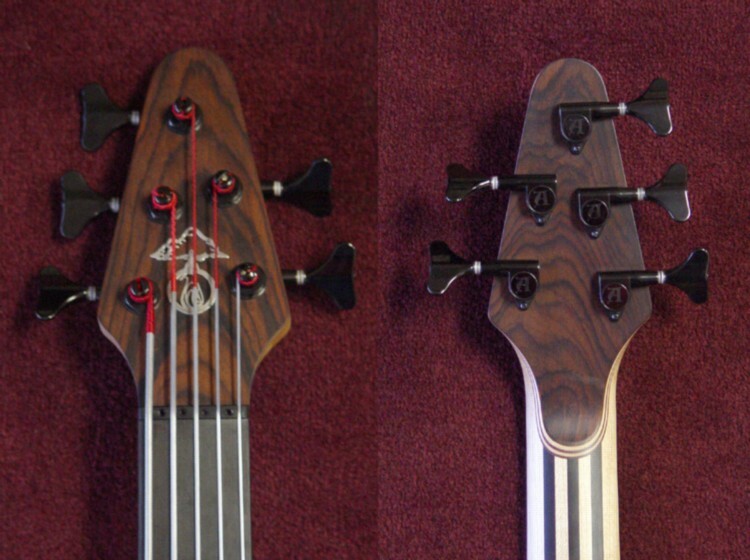 And I love the top and back laminates; they look great with the Ebony neck lams. And I think the horn adjustments look good too; the body shape flows nicely. And your idea on the contours makes sense for this bass. Congrats on a beautiful bass!! e wreed skoon gitareke manneke ...alleen ...die headstock ...zucht. Truly an exquisitely understated custom instrument with a whole lot of "that's a good idea" type things tossed in. Looks kinda go without saying. But I'll say it anyway. Sweet! This has my vote for favorite Alembic body. Congratulations on a tastefully executed instrument. Superb, Bob. After viewing a 'sneak peek' months ago, I knew the description/explanation would be special, and indeed it is. A very unique and innovative design...I'm sure you spent many hours in the 'research & development' phase of this project. Let me guess, Ron gets a Christmas card every year from now on, right?? Love the shape, love the finish, love the half SF-2 on board. Absolutely gorgeous axe! The ultimate! Congratulations. Now this is simply awesome. The elecs are absolutely out of this world!!! And those black tuners really match the fretless ebony fingerboard - if I were you' I'd also order blackened hardware to match it, but... that's just a mere detail. This bass is phenomenal. Congrats! I just read the post.Could you explain me what do you mean by "AXY neck with the coil positioned off centre"? The idea with the neck pickup, was to move it as far toward the bridge as possible, without chopping out more wood. What I ended up with here is about the same as taking an MXY pickup - the skinny one - and placing it as far toward the bridge as possible, then filling up the rest of the larger AXY routing hole with plastic. Again, the AXY and MXY pickups use the same exact coil; the AXY just happens to have a larger piece of plastic around it. So instead of centering the coil in the large housing, the coil was placed toward the bridge side. I hope that makes it more clear. As for the 18V supply, I am not able to make any direct comparisons. I did not request it - Ron just did it because he apparently felt this particular circuit required more power, being more complicated than usual. As you suggest, 9V seems to be more than sufficient in most cases. I'm sure the folks at Alembic will be able to advise you on what to do for your custom. 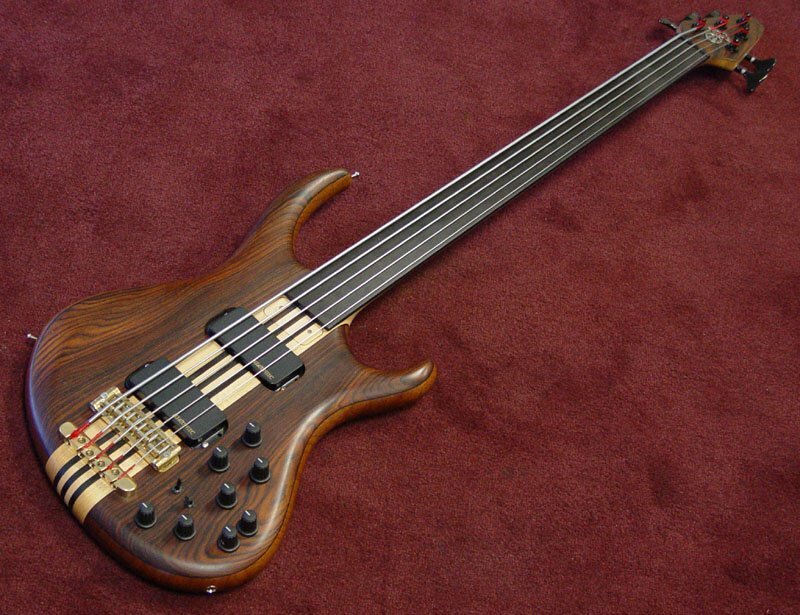 And as long as this thread has been resurrected... yes, basstard, I thought very seriously about blackened hardware, but at the time, Alembic was switching to a new plater because of quality issues, plus it was outrageously expensive. I figured I could always do it later, but it turns out I'm quite happy with the plain (not laquered) brass. Thanks all for the kind words, but most of all, thanks again to Alembic. I really like the electronics on your instruments, the look too of course. I did a search on the EMW and I came across your bass. Why don't you have a extra 3 positions switch fitted, like I did, with mono/stereo/reverse stereo? The reverse stereo allows you to swap the channels quickly without disconnecting the Jack, useful when trying different effects. Absolutely love the dark wood flavor. She must really play like butta' and sound like anything you want. With as many tone options you have it's most likely your still enjoying experimenting and will be for some time to come. lg - the answers are pretty simple. The bass isn't wired for stereo in the first place, I just wasn't interested in going that route. And I don't use any effects. The SF-2 is actually my preamp. My comment about using only one channel of the SF-2 was only to indicate that I'm finding I don't generally need the other, since the bass itself is so flexible. I do actually play with the second filter once in a while, just not very often. My current setup routes one channel of the SF-2 (the one I do use) to the ELF, so I play with the lows there, while the other channel runs full range to the other cabinet. For that, I generally find I can get what I want straight from the instrument controls. Plus, I already need two amp channels because of the ELF, so end to end stereo starts getting really messy (and expensive) beyond that. For me, it was a carefully considered compromise between flexibility and simplicity. Certainly some of the things you've done are more flexible, but I don't seem to need all that (and this is already pretty complicated). I tend to be interested in a more narrow range of subtle tonal differences (for example, Ray Brown versus Miroslav Vitous? ), and find I can do that pretty easily. The real treat for me is that I always have the option of mixing the full range signals, with a filtered signal of my choice. You can also do that with an SF-2... but only if you don't use the filter(s) on the instrument. Once you start rolling off with the standard instrument filters, you can't really get that stuff back. Hi Bob, I understand what your saying, it's clear. But in case you were wondering, or didn't know either, going from mono to stereo or your instrument, wouldn't be a big job at all, and further, it wouldn't cost much at all. All it would require is a stereo jack socket and a switch, the wiring would be easy. Well, I don't have an SF-2, but I hope that one day I'll get one. I think that your bass as the most powerful and versatile circuitry I've seen on this forum, my favorite so far! 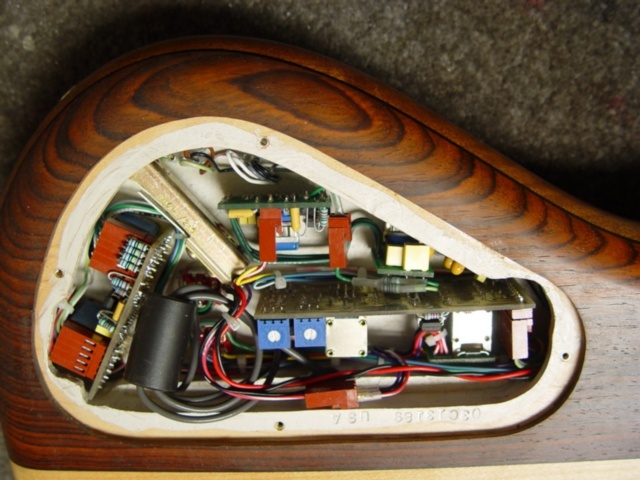 A "plain" Alembic circuit, PUs an volumes only, going in stereo directly to one or two SF-2s... That could be great! this bass is AMAZING!!! any way we can hear some sound clips? Instrument projects such as this one allow Alembic to really shine in their pursuit of excellence. 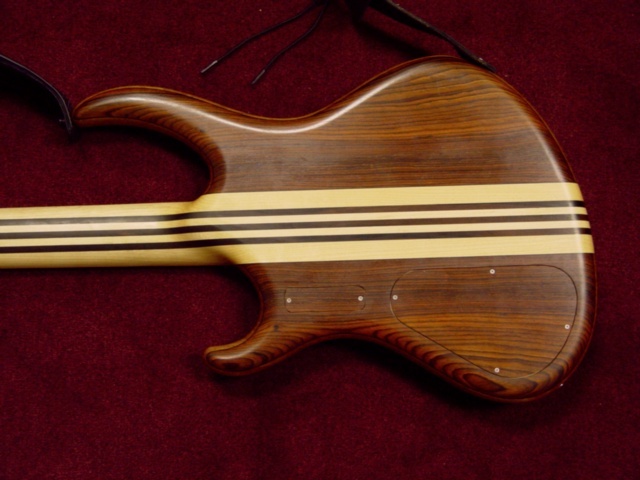 Congratulations , This seems like the ultimate fretless! Well... You can get the "most amazing rogue ever" prize with these jewell. Congrats! 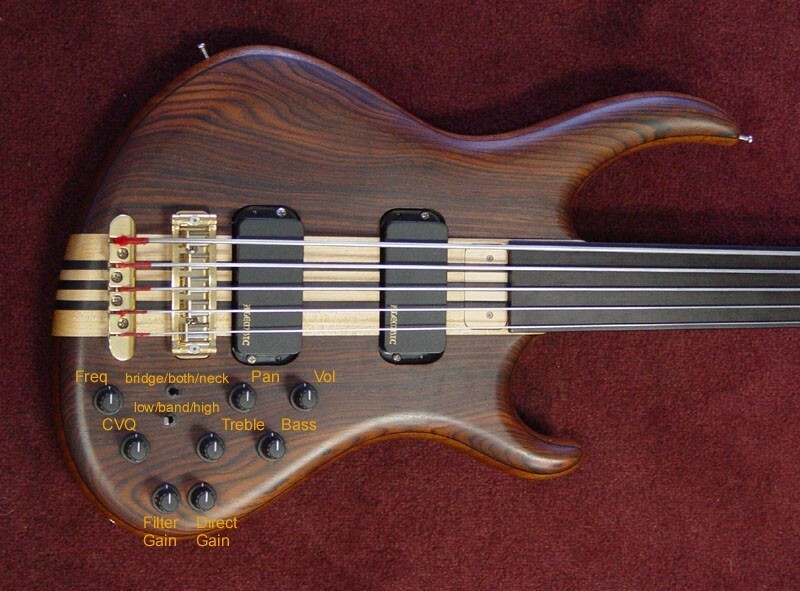 This is indeed a wonderful and amazing bass; I love everything about it. Hm, I thought that Alembic had stopped installing superfilters in basses a long time ago, I've always wanted an onboard superfilter! Once I got used to using one, standard eqs always seem so limited and funny sounding. I would imagine that on a fretless, these electronics sound great. Clips? Do you have any photos or videos of you playing the bass? I love this bass.I'm a novice (I have an Elan)and am not sharp w/the engineering,but I get the drift.I some day hope to build a 4st quilt maple or satinwood using your bass as a starting place.I'm leaning EMW, but as I learn more from the forum,I' am considering new possibillities.Wonderful concept.I'm sure you are thrilled.